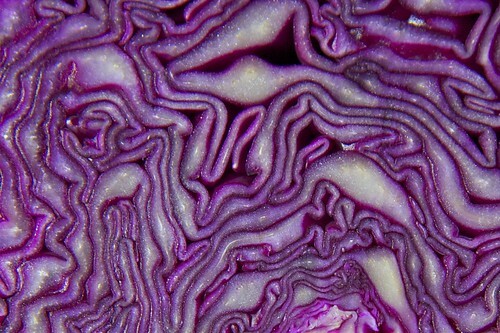 Close-Up Cabbage, originally uploaded by webmink. I was cooking for 10 today, so decided to sauté red cabbage as a side-dish. Sliced into half-centimetre ribbons, I cooked it in melted butter with a little balsamic vinegar, plenty of pepper and a handful of sultanas. I cooked it until it was shiny and floppy but still crispy. Seemed to go down OK, except with the children at the table. The kids may find it more interesting to use cabbage as a ph indicator; kitchen science experiments are fun! Ours found the experiments interesting, eating it less so.